What are Cow Magnets For Organic Cows? "Cow magnets - For Organic Beef and Dairy Cows"
Cost: Quantity 144 @ $1.45/pc. How does the Ceramic 10CM CP-6 (Patent # 7,557,685) material compare to Alnico cow magnets? 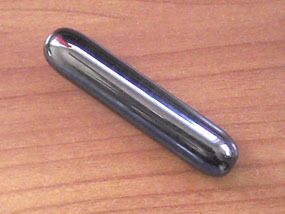 Alnico magnets have toxic Aluminum and Nickel. Prop 65 attributes Nickel to causing cancer and possibly Male Reproductive Toxicity, Female Reproductive Toxicity, Developmental Toxicity, https://oehha.ca.gov/proposition-65/chemicals/nickel-metallic. Alnico Magnets also demagnetize faster than the CP-6; CP-6 is 100% guaranteed strong for 30 years; The CP-6 also costs 20-40% less than Alnico cow magnets. How does the Ceramic 10CM material compare to Stainless Steel (SS) covered NdFeB? NdFeB magnets covered with SS will rust from the inside out in 3-6 years. This Ceramic 10CM magnet material will last 30 years with less than 5% loss of strength. It is 100% guaranteed for 30 years, to work stronger and longer than Stainless Steel covered NdFeB rare earth magnets. As it does dissolve over the years it will only release a healthy mineral supplement. The best performing cow magnet for less ($0.91/pc.) Uses no Ni, Co, NdFeB, or SmCo expensive rare earth materials. This is the magnet of the future. How does the Ceramic 10CM material compare to Nylon coated Ceramic? Nylon is a petrochemical. It is not a healthy mineral. It also is and added cost. 1) Nylon or Plastic (Petroleum Hydrocarbons) polymer with hexahydro-2h-azepin-2-one and 1,6-hexanediamine [24993-04-2] petroleum based coating, normally contains lead, dissolves in sulfuric stomach acid to form sticky non-digestable gum plug. Liver damage, kidney damage, nervous disorders and death. A compound formed by combination of a metal ion in solution with a compound containing heteroatoms (such as oxygen or nitrogen), in which at least two heteroatoms are bound to the metal. The bonds may be covalent or non-covalent. Chelates in some cases have very low dissociation constants, and organic compounds (chelating agents) which form such chelates are therefore used to reduce the concentration of free metal ions in solution. Durable Its durable structure boasts plated, solid steel end caps for corrosion prevention and a solid steel connector rod through the core to reduce breakage in shipping and handling. No plastic parts involved. Stronger Magnetizaton before assembly creates a consistent pulling force from each section along the length of the magnet and enhances its overall strength. Superior Characteristically, the Ru-Master 5 has rounder ends and is slightly heavier than the original heavy duty cow magnet. These qualities make it easier for the magnet to travel to the stomach and stay there. The Ultimate Heavy Duty Cow Magnet! A. Part No. DMRUM-5 - Measures 3/4 dia. x 3-3/8 long. Made in U.S.A.
Alnico 5 Cow Pill - A favorite of Dairymen and Vets for over 30 years! This is the standard cast Alnico 5 cow magnet with bright, metal finish. It is non-toxic and non-corrosive in use. This rectangular cow magnet is made of Ceramic 5 (Strontium Ferrite) magnet material. 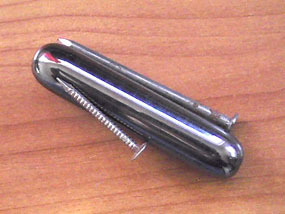 Its special magnetization pattern causes nails and other sharp metal objects line up along the length of the magnet where they are no longer a danger to the cow. The FDA-approved epoxy coating is gentle on the cow and helps protect the magnet from chipping. Rounded corners ensure safe and easy passage to the recticulum.